A world-first book combining evolutionary ecology and oncology aims to improve cancer prevention and therapies. When Deakin University's Dr Beata Ujvari was asked by a publishing company to suggest an idea for a book, she didn't envision co-editing a first-of-its-kind publication in an exciting new scientific field. Dr Ujvari, a molecular biologist and geneticist with an interest in evolutionary biology from Deakin's Centre for Integrative Ecology (CIE), was looking for a textbook on the ecology and evolution of cancer. She thought only that she would like someone to write such a book, so she could read it. Three years later, "The Ecology and Evolution of Cancer" is the first in the relatively new field of evolutionary medicine, which encompasses the disciplines of ecology, oncology and biology and takes an evolutionary and ecology approach to treating cancer. "With this book, we are proposing a new concept that we should bring evolutionary knowledge into how we treat cancer patients," Dr Ujvari said. "Current cancer treatment attempts to completely eradicate the tumour. However, there are always one or two cells that survive and, by the process of trying to eradicate everything you are actually selecting for treatment resistant cancer cells. "The idea of the evolutionary and ecology approach is to tailor the treatment to the tumour, not to eradicate it but to slow its growth and prevent it metastasising," she explained. "This concept has been advocated by a small number of people for about 50 years, but now the field is growing. "That's why we really need this book, to open up the field for people who are not reading evolutionary literature about evolutionary oncology." 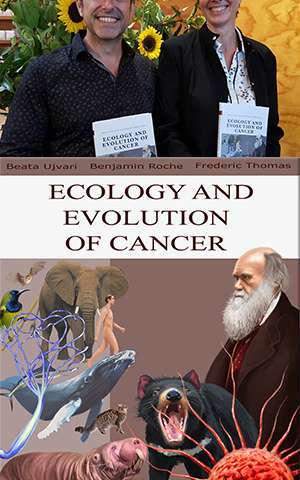 Launched last month by French scientific and technology attaché Anne Rouault, "The Ecology and Evolution of Cancer" was co-edited by Dr Ujvari and French scientists Dr Frederic Thomas and Dr Benjamin Roche, co-founders of the French research institution The Centre for Ecological and Evolutionary Cancer Research. The book's distinctive cover, designed by French artist Eric Pelatan, is designed to capture different aspects of the evolutionary and ecology approach. It features Charles Darwin as the author of the theory of evolution, the Tasmanian Devil as the iconic species for transmissible cancer, and a number of species that are highly resistant to cancer including the naked mole rat, the elephant and the whale. It also depicts a hydra, a lower ranked organism which can be affected by cancer, illustrating that the disease is not unique to highly-developed, multicellular organisms. Dr Ujvari hoped that, as both an introduction to cancer evolution and a review of current research in the field, "The Ecology and Evolution of Cancer" would attract a wide audience. "The book, like the field, is quite broad," she said. "We're trying to bridge ecology, evolution, cancer research and oncology and attract academics, students and clinicians as well as the general public. "The topic is so new that people might just glance over it, but the cover is so attractive we hope people will pick it up to see what it's about. "There is a lot of science in the chapters, but all our authors tried to make the subject matter accessible, so that if you came across it in a bookshop you would understand it." Dr Ujvari said that while people look upon cancer as a recent disease, it had actually been present during the whole of human evolutionary history, with evidence of prostate cancer being discovered in ancient Egyptian mummies. "People, and other animals, have developed tumour resistant mechanisms over time and we could study those mechanisms and exploit them for better knowledge, for better treatment and better outcomes," she said. 'It's knowledge that has been largely overlooked until now." How can evolutionary biology explain why we get cancer?